Carson, L. (2012). Developing a deeper understanding of learning processing during unguided complex learning tasks: Implications for language advising. Studies in Self-Access Learning Journal, 3(1), 6-23. This paper outlines a research project that is mapping cognitive, metacognitive and other processing types and their interactions in complex learning situations, specifically in learning situations without teacher guidance. It presents some examples from the findings of this project and the implications for learning advisors working with adult (tertiary level) advisees who are engaged, to a large degree, with independent forms of learning. When we look at learning occurring without instruction, we see very dynamic thinking processes that involve continuous movement between the upper and lower levels of cognitive processing. The manner of this processing differs from learning processing during classroom learning, which is highly structured and directed. As the main difference between independent learning and classroom learning is the absence of a teacher, this paper focuses on the type of processing that takes on the cognitive functions created by this absence – metacognitive processing. The data shows that, for the population in this study, all learners involved in independent learning necessarily engaged in frequent metacognitive processes, though with greater and lesser levels of success or effectiveness. This research indicates that it is not possible to complete any form of complex independent learning task without engaging in frequent upper level processing. The paper then discusses what this means for learning advisors, and how we discuss learning concepts and learning control with advisees, through ideas such as using existing knowledge, and the planning, monitoring and control of learning. Much of the research on cognitive processing in learning is the result of crossover between the fields of education and cognitive science (Son, 2007). While this has brought great benefit to understanding learning, it has also brought with it the examination of learning from a research position that is traditionally laboratory-based, where elements are controlled for. However, learning advisors tend to work with students who will be working independently, in various physical and contextual environments, with various goals and needs, and strengths and weaknesses. In other words, they will be working in a manner that is less controlled than a laboratory, and less controlled than a classroom setting, or the learning settings examined in much of the research to date. Rather than taking the understandings of learning processing gleaned from such research, and using it to guide learning advising, it is the position of this paper that learning advisors need to understanding learning as it will occur for their advisees in the real world; that is, learning that is complex, and subject to influence by the many variables present. In this paper, complex learning tasks are considered to be any learning tasks that involve understanding, remembering, combining or using more than one discrete item. Complex learning will occur during a learning task where exacting instruction (instruction requiring a student to engage with one or two elements, and then stop and wait for the next instruction) is not provided, and completion requires engagement with many elements, be they content elements or options for undertaking and completing the task. In a language-learning scenario, if students are asked to check a vocabulary item in a dictionary, they are not engaged in complex learning. However, if they are asked to prepare a presentation in a second language (either by themselves or with peers), they are engaged in complex learning, since it involves engagement with multiple elements and steps that are interconnected (e.g. planning how to use time, deciding who will perform different tasks, understanding content, checking language, synthesizing content, combining ideas). If independent learning can be defined as “the act of learning without (or with decreasing amounts of) external direction, guidance and evaluation” (Carson, 2012), then independent learning is very obviously complex learning. In this paper, this definition is used rather than others, and rather than terminologies such as autonomous learning or self –regulated learning, because these terminologies and their definitions often either explicitly or implicitly include the concept of volitional learning. While such learning is also complex learning, it excludes a huge range of learning endeavours that are undertaken independently, but where the initial impetus or decision to engage in the learning was not volitional, or perhaps where the content was pre-determined. Some examples of non-volitional but independent learning would be in-class learning without step-by-step instruction, project learning, individual test preparation, thesis writing and some work-based learning (learning that occurs as part of our working lives – while adults often volitionally chose what and when to learn, this is not always the case in career situations where acquiring new knowledge, of for example, a new computer system, is a requirement rather than a choice). “One of the most challenging issues that confronts educational researchers is explaining how students learn in self-regulated contexts, such as when studying or practicing on their own” (Zimmerman & Moylan, 2009, p.299). By examining ‘non-volitional’ learning, it is possible for the researcher to create some degree of structure to allow for the accurate collection of valid data, through, for example, setting specific learning tasks, or choosing a specific ‘site’ for learning. In order to understand learning, we need to know what happens when people are learning. However, as learning situations become more learner-centred, less teacher-directed, more independent and autonomous, what the learner must do in these situations changes. It follows from this that existing knowledge and research on learning and learning processing in more static or teacher-centred settings, upon which many theories of learning and the creation of learning interventions sit, may not be applicable to or indicative of the type, range, frequency, hierarchies and importance of learning processing that occurs during less guided complex learning. For learning advisors, who typically work with students engaged with learning at the more independent end of the spectrum, the dialogue and tools they choose to use with advisees should be based upon a clear understanding of learning processing in this context. As Benson (2011) notes: “Learners who are asked to take greater control of their learning, or who are forced by circumstances to do so, may be able to self-manage their learning, but they will not necessarily have the cognitive competencies that will make self-management systematic or effective” (pp. 111-112). Only by more deeply examining learning that requires these ‘cognitive competencies’ can we understand what they are and how they function in different contexts, and in turn, advise for them. “knowledge of thinking processes, both knowledge of the thinking occurring in the here and now (e.g., “I am really struggling to figure out how to write this introduction; I believe that the introduction I have just written makes sense”) and in the long-term (e.g., “I know a number of specific strategies for planning a composition, rough drafting it, and revising the draft”)” (p. 27). What makes this definition useful is the inclusion of thinking ‘in the here and now’ and ‘in the long term’. This inclusion is central to understanding metacognitive processing in independent learning, and to distinguish it from understood conceptualisatons of self-regulation as a regular, but low frequency, cyclical process, as espoused by researchers in that field (Brown, 1987; Kaplan, 2008; Schunk, 2008; Veenman, 2007; Zimmerman, 2002, 2008). In other words, metacognition in independent learning is also a prevalent, ‘during learning’ type of processing, not only an occasional governing type of processing that links and controls cycles or episodes of learning. It functions on both levels – at the very local level within a learning task (e.g. deciding to spend time rewriting an answer before beginning the next section), and at the more global level (e.g. being aware that you make certain grammar errors often and deciding to be conscious and controlling of these in future learning). “a qualitative research method that uses a systematized set of procedures to develop and inductively derive grounded theory about a phenomenon” (Strauss & Corbin, 1998, p.24), the goal of which is “to generate a theory that accounts for a pattern of behaviour, which is relevant to those involved” (Glaser, 1978, p.3). As such, the larger data set was not collected in order to prove any hypothesis, but rather to elucidate what was happening during learning. To look at learning processing during complex learning, concurrent verbal protocol analysis (VPA) was used. VPA is a method where subjects are asked to verbalize what they are doing and what they are thinking while undertaking a task (concurrent VPA), or verbalising this through prompting after undertaking a task (stimulated recall VPA). Some researchers claim VPA “offers a much more direct window on processing than other forms of comprehension measurement” (Pressley, 2000, p.291). Through training the participants to vocalise all thoughts occurring during the activity, these vocalisations reflect the individual’s thought processes, and the reasons for the resulting actions, or what the participants think they are doing. However, there are issues with VPA as a method of inquiry, as a data collection tool, such as the possibility that “these procedures may disrupt the verbal processing of the task” (Ward & Traweek, 1993, p.472). Yet, by using the concurrent form of VPA, this can be avoided. What is required is a think aloud protocol without reactive effects that does not disrupt or change spontaneous thought. While a reactive tool has very beneficial effects on thinking, for the purposes of looking at cognitive processing exactly as it occurs, a non-reactive form is required. Ericsson & Simon (1998) have made a clear distinction between these two forms. What is important here in terms of data collection is that this ‘covert thinking’ is not altered by the process- “perhaps the single most important precondition for successful direct expression of thinking is that the participants are allowed to maintain undisputed focus on the completion of the task while thinking aloud and merely to verbalize their thoughts rather than describe or explain them to anyone else” (Ericsson & Simon, 1998, p.181). In other words, subjects (using concurrent rather than stimulated recall VPA) are not analyzing the task in an abstracted sense; rather, they are simply doing the task and verbalizing what is occurring, thus not disrupting the natural progression or sequence of their thoughts. This led to the choice of concurrent VPA as a data collection tool in this study. Criticisms of VPA discuss reactivity and automaticity. However, with regard to reactivity when using concurrent protocols, there are as yet no empirical studies to indicate that the procedure causes processing to change (Ericsson & Simon, 1993; Leow & Morgan-Short, 2004). The issue of automaticity relates to the fact that learners may automatically engage in some processing, and as such not verbalize or report it. However, this issue can be overcome in a number of ways. In this study, it was overcome by video-recording all VPAs and by having a large data set size. Two examples of metacognitive activity that were generally automatic in this study (and as such not verbalized) were the decisions to re-read text that had not been fully comprehended, and the decision about when to take notes about important information. The video-recordings made it possible to see when these activities occurred, even though they did not appear in the VPA transcripts. The large data set gave confirmation that, for the subject population, these activities occurred often, and unlike many others were largely automatic. In the larger project, participants were asked to engage in a variety of independent complex learning tasks. In a grounded theory research project, the goal is not to prove or disprove a hypothesis, but rather to develop a data driven understanding of something. In this project, the goal was to understand how metacognition occurs during independent learning, as there is absence of empirical research on this specific area – how do learners engage in metacognitive processing as they take control of their own learning? A theoretical sample was used, in line with grounded theory methodology, and participants engaged in a variety of learning tasks (some focused on learning domain-specific academic content, others on planning learning or on non-domain-specific learning). Participants also engaged in individual, pair and group learning scenarios. 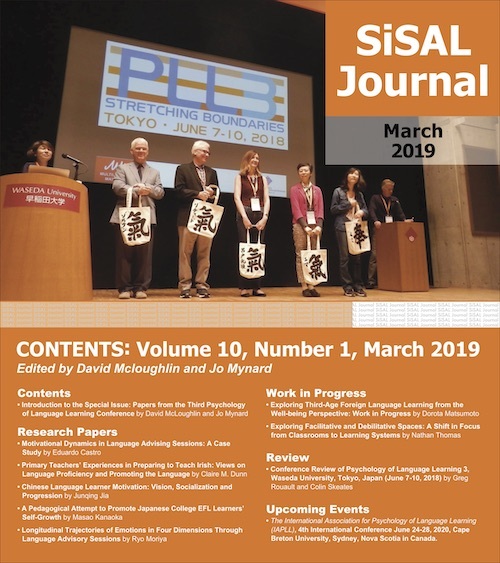 The study was undertaken at a Japanese university with 30 English language major students, and as such, the findings cannot be considered widely generalisable (rather a starting point for further research). The participants had all chosen to take a university elective course about independent learning. All were trained in the process of verbal protocol analysis before the research began. Given the scope of this paper, and for the purpose of discussion, only some of the findings are presented here. The findings below are from one independent learning task. It is perhaps important to note here, that although the above task is a planning task, it does not differ from other learning tasks (such as writing an essay), except in the content. Planning, rather than just an element of the learning process, also becomes the content of the learning task in this instance. The original data set was largely in Japanese (subjects were allowed to use whatever language or languages were natural for them to complete the task, so as not to interfere with processing) and compiled from the VPA and observational notes, as all subjects were both audio and video- recorded. Analysis and coding of the data revealed 5 distinct categories of processing occurring during learning, which are defined in Table 2. Table 2. 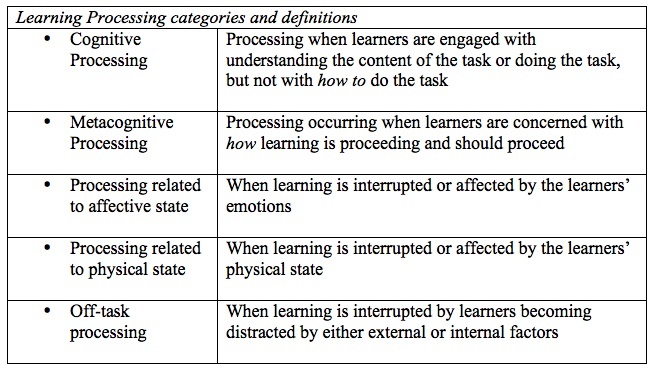 Learning processing categories and definitions (Carson, 2012). Through the grounded theory process, all of these categories and definitions emerged from the data, rather than being imposed on the data. They can be considered reliable as they were developed and proved consistent (through the use of the GTM constant comparison methodology) across a much larger body of data (larger in terms of participants, and varieties of learning tasks). Perhaps the most interesting findings in relation to independent learning were the frequency of occurrence of metacognitive processing, how these frequencies ranged across different participants, and the frequencies of occurrence of the three main categories of metacognitive processing – knowledge, monitoring and control. Examples of coded verbalizations from the data are included in Appendix A and Appendix B. 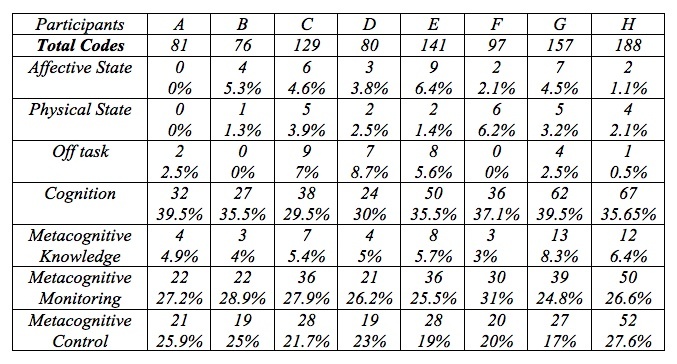 In Table 3, the numbers represent the number of instances when a particular type of processing occurred, and the percentages indicate the percentage of instances of each type of processing as part of all processing. Neither the numeric instances nor the percentages are indicative of the amount of time spent on different forms of processing. For all participants, the greatest amount of time was spent on cognitive processing (though instances of cognition, and other processing categories, vary in length). What is immediately clear from these data is the centrality of metacognition to how subjects undertook this learning task. It accounts for over 50% of all coded instances of processing activity, for all subjects, when each category of metacognition is viewed as a distinct category of processing. However, this table shows clear differences in the number of instances of categories across the 8 participants. Looking at the total numbers of codes per participant we have the very wide range of 76-188. These numbers illustrate the number of times the subjects switched from one type of processing to another. Yet by looking at the data in terms of the percentage of instances across categories, we can see much tighter ranges, showing patterns of processing behaviour. Looking at metacognition processing instances as a percentage of total processing instances per subject, we have a range of 51.1% – 60.65%. When we break metacognition down into its 3 main categories, we also see tighter ranges than the numeric instances would indicate as shown in Table 4. These percentages show that some participants (perhaps surprisingly) were able to stay entirely ‘on-task’ for 90 minutes, without becoming distracted or de-motivated. As can be seen in the figure below (which separates metacognitive knowledge, monitoring and control), as a learner is engaged in an independent learning task, he or she moves very often between engagement with the content (cognition) to thinking about how to proceed with learning (metacognition). 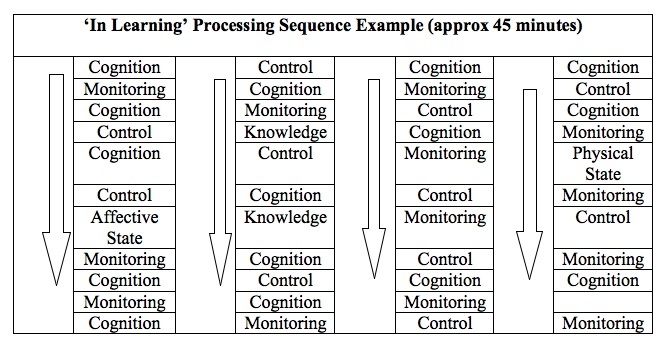 In looking at this processing sequence example, we can see how embedded and frequent are the metacognitive processing elements during the undertaking of an independent learning task. Moving from left to right, the figure provides a snapshot of how an individual learner’s processing occurred over a 45-minute period. Of particular relevance is that metacognitive processing elements are consistently present throughout the learning episode. They are not more frequent where they might be expected to be concentrated – for example at the beginning or planning stage of undertaking learning, or towards then at the end, as learners evaluate if and how they have completed the task. Metacognitive processing is a consistent element throughout the independent learning task. The findings above provide a snapshot of the complex interplay between all forms of processing occurring during learning. Densely present throughout the learning process is multi-dimensional metacognitive processing. The importance of this for learning performance is clear, and further study of the quality of this processing will provide us with more information with which to better advise our learners. This understanding of metacognition has some important implications, which are discussed below, for how advisors view this concept, how they incorporate it into their discussions with learners, and how learning advising as a field continues to research learning. The distinction between metacognition and self-regulation is very important as the conceptualizations of self-regulation do not describe a high frequency thinking activity occurring during learning, which is the type of thinking uncovered by the data in this paper and defined as metacognition. Rather, self-regulation is generally discussed as a more global control mechanism that learners use at certain intervals (Borkowski, 1996; Butterfield & Belmont, 1977; Stromso & Braten, 2010; Zimmerman, 2002). However it is also worth noting, that within the field of self-regulation, this understanding is also in dispute (Veenman, 2007). In order to understand learning processing, and as advisors seeking to facilitate more effective processing, we need to understand metacognition as a high frequency, embedded, necessary element of independent learning processing, that all learners are engaging in. The data discussed in this paper show that conscious metacognitive knowledge occurs with much less frequency than monitoring and control. This provides advisors with three separate pieces of information. Firstly, monitoring and control decisions are highly frequent during independent learning (e.g. for the task discussed in this study, the 8 participants individually made between 19 and 52 control decisions –deciding to skip sections, allocating more time to certain questions than others, deciding to change time allocations in order to re-read when they had not fully understood a text, deciding to work on computer instead of paper, deciding the task had been sufficiently completed before the end of the time allocated, etc.). The data from this exploratory project suggest that when we discuss independent learning with advisees, rather than simply discussing the more global, self-regulatory ‘out of learning’ management (when students are planning learning, reflecting on completed learning or thinking about future learning), we also need to take time to discuss and elucidate the ‘in learning’ management (when students are engaged in learning). Secondly, the lower frequencies of metacognitive knowledge are not indicative of any lesser importance. A learner’s ability to draw on past learning experiences and strategies can have a major impact on task performance and learning effectiveness (Bromme, Pieschl, & Stahl, 2010; Masui, 1999; Swanson, 1990; Vrugt & Oort, 2008; Wenden, 1999). As such, it may be important for advisors to more explicitly encourage learner reflection on, and use of, their metacognitive knowledge (Cotterall & Murray, 2009). Thirdly, if the use of metacognitive knowledge is at times unconscious, it may be useful to show students how this occurs, and provide them with examples of both positive and negative instances of this unconscious behaviour. Making this explicit and ‘conscious’ then makes the use of such knowledge available and amenable to change. It is important to distinguish between the literature on metacognition training and interventions for ‘traditional’ classroom learning (Hacker, Dunlosky, & Graesser, 1998; Hartman, 2002; Masui, 1999; Su & Reeve, 2011; Ward & Traweek, 1993) and independent learning settings. As this data set showed, it was not possible for learning to be completed without metacognitive activity. What this means is that although there is much literature on the practice of teaching interventions to encourage and increase metacognitive behaviours during learning, with regard to independent learning, we may need to change to focus of such practice. Rather than looking to ‘increase’ or ‘encourage’ such behaviours, we should look to explicitly explain and discuss these behaviours, with the goal of improving them (as often, metacognitive activity can have negative results, when knowledge, judgments and decisions are inaccurate or ineffective), not increasing them. This can be done both through a process of discovery, as put forward by Holec (1981) for the development of autonomy, but may also be dealt with through explicit discussion and explanation in advising interactions. The process of co-constructing knowledge about learning between an advisor and advisee, in relation to prior and future learning, has huge value for advisees in terms of developing their independent learning ability. However, as advisors hope to encourage effective and, ultimately, optimal learning, it is important to have an accurate picture of what is occurring when the advisees are not only thinking about and analysing their learning, but also when they are engaged in learning. For example, it is important not to limit the discussion of ‘control decisions’ to the learning planning stage or the post-evaluation stage, if these decisions are prevalent and constant during independent learning. While this paper has highlighted the degree to which metacognitive processing occurs during independent learning, how and why different learners are more or less effective with this processing is a major area of concern for advising. Broader empirical examination of the differences between learning processing during directed learning and independent learning, alongside more in-depth studies in independent learning settings, would provide learning advisors with more evidence from which to begin facilitating better learning, and a better understanding of the challenges learners face as they engage in increasingly independent complex learning. Luke Carson is an Associate Professor in the Center for Language Education at Ritsumeikan Asia Pacific University in Japan. His research interests are cognition, meta-level thinking constructs and autonomy. Benson, P. (2011). Teaching and researching autonomy. Harlow: Pearson. Borkowski, J. G. (1996). Metacognition: Theory or chapter heading? Learning and Individual Differences, 8(4), 391-402. Bromme, R., Pieschl, S., & Stahl, E. (2010). Epistemological beliefs are standards for adaptive learning: a functional theory about epistemological beliefs and metacognition. Metacognition Learning, 5, 7-26. Brown, A. (1987). Metacognition, executive control, self-regulation, and other more mysterious mechanisms. In F. Weinert & R. Kluwe (Eds. ), Metacognition, motivation and understanding (pp. 65-116). New Jersey: Erlbaum. Butterfield, E. C., & Belmont, J. M. (1977). Assessing and improving the executive cognitive functions of mentally retarded people. In I. Bialer & M. Sternlicht (Eds. ), Psychological issues in mental retardation. New York: Psychological Dimensions. Carson, L. (2012). The multi-dimensional complex interplay between metacognitive processing and other forms of processing during independent learning. Unpublished thesis. Dublin City University. Cotterall, S., & Murray, G. (2009). Enhancing metacognitive knowledge: Structure, affordances and self. System, 37, 34-45. Ericsson, K. A., & Simon, H. A. (1993). Protocol Analysis: Verbal Reports as Data (Revised Addition ed.). Massachusetts: MIT Press. Ericsson, K. A., & Simon, H. A. (1998). How to study thinking in everyday life: Contrasting think-aloud protocols with descriptions and explanations of thinking. Mind, Culture and Activity, 5(3), 178-186. Flavell, J. H. (1976). Metacognitive aspects of problem solving. In L. B. Resnick (Ed. ), The nature of intelligence (pp. 231-236). New Jersey: Erlbaum. Glaser, B. G. (1978). Theoretical sensitivity: Advances in the methodology of grounded theory. California: Sociology Press. Hacker, D. J., Dunlosky, J., & Graesser, A. C. (1998). Metacognition in educational theory and practice. New Jersey: Lawrence Erlbaum. Hartman, H. J. (2002). Teaching metacognitively. In H. J. Hartman (Ed. ), Metacognition in learning and instruction: Theory, research and practice (2nd ed., pp. 173-202). Dordrecht: Kluwer Academic Publishers. Holec, H. (1981). Autonomy and foreign language learning. London: Pergamon. Kaplan, A. (2008). Clarifying Metacognition, self regulation and self-regulated learning: What’s the purpose? Educational Psychological Review 20, 477-484. Leow, R. P., & Morgan-Short, K. (2004). To think aloud or not to think aloud: the issue of reactivity in SLA research methodology. Studies in Second Language Acquisition, 26, 35-57. Masui, C. D. C., E. (1999). Enhancing learning and problem solving skills: orienting and self-judging, two powerful and trainable learning tools. Learning and Instruction, 9, 517-542. Pressley, M. (2000). Development of grounded theories of complex cognitive processing: Exhaustive within- and between study analyses of think- aloud data. In G. Schraw & J. C. Impara (Eds. ), Issues in the measurement of metacognition (pp.262-296). Nebraska: Buros Institute of Mental Measurement. Pressley, M., & McCormick, C. (1995). Advanced educational psychology for educators, researchers and policymakers. New York: Harper Collins. Schunk, D.H. (2008). Metacognition, self-regulation, and self-regulated learning: Research recommendations. Educational Pyschology Review, 20, 463-467. Strauss, A., & Corbin, J. (1998). Basics of qualitative research. Techniques and procedures for developing grounded theory (2nd Edition ed.). California: Sage. Son, L. K. (2007). Introduction: A metacognition bridge. European Journal of Cognitive Psychology 19(4), 481 – 493. Stromso, H. I., & Braten, I. (2010). The role of personal epistemology in the self-regulation of internet-based learning. Metacognition Learning, 5, 91-111. Su, Y.-L., & Reeve, J. (2011). A meta-analysis of the effectiveness of intervention programs Knowledge or cognitive activity that takes as its object, or regulates, any aspect of cognitive enterprise designed to support autonomy. Educational Psychology Review, 23, 159-188. Swanson, H. L. (1990). Influence of metacognitive knowledge and aptitude on problem solving. Journal of Educational Psychology, 82. Veenman, M.V.J. (2007). The assessment and instruction of self-regulation in computer-based environments: a discussion. Metacognition Learning, 2, 177-183. Vrugt, A., & Oort, F. J. (2008). Metacognition, achievement goals, study strategies and academic achievement: pathways to achievement. Metacognition Learning, 30, 123-146. Ward, L., & Traweek, D. (1993). Application of a metacognitive strategy to assessment, intervention, and consultation: A think-aloud technique. Journal of School Psychology, 31, 469 – 485. Wenden, A. L. (1999). An introduction to metacognitive knowledge and beliefs in language learning: Beyond the basics. System, 27, 435-441. Zimmerman, B.J. (2008). Investigating self-regulation and motivation: Historical background, methodological developments, and future prospects. American Educational Research Journal, 44(1), 166-183. Zimmerman, B. J., & Moylan, A. R. (2009). Where metacognition and motivation intersect (pp.299-316). In D. J. Hacker, J. Dunlosky & A. C. Graesser (Eds. ), Handbook of metacognition. New York: Routledge.